South Korea's President Moon Jae-in, left, shakes hands with Japan's Prime Minister Shinzo Abe before their meeting at Abe's official residence in Tokyo, May 9, 2018. Relations between South Korea and Japan continue to sour as a pair of diplomatic disputes creates a renewed strain on bilateral ties between Seoul and Tokyo. FILE- Victims of Japan's forced labor and their family members arrive at the Supreme Court in Seoul, South Korea, Nov. 29, 2018. The sign reads " Mitsubishi Heavy Industries apologize and compensate victims." Despite the discussions taking place between Seoul and Tokyo to resolve the issue of asset seizure and military interactions, Yang doesn’t see the disputes affecting how the two governments communicate or work together to maintain regional security. “The Japanese government endorsed the Panmunjom declaration. So two governments share the same view on denuclearization and peace on the Korean Peninsula,” Yang said. 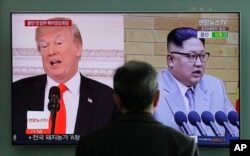 FILE - A man watches a TV screen showing file footages of U.S. President Donald Trump, left, and North Korean leader Kim Jong Un during a news program at the Seoul Railway Station in Seoul, South Korea, March 27, 2018. The Institute for Far Eastern Studies at Kyungnam University’s Cho Jin-goo also agreed that Tokyo’s support for North Korea’s denuclearization is important, but if the current disagreements can’t be resolved in a relatively short period of time, it could affect larger issues. “So the longer the dispute lasts, the worse the relationship [between Seoul and Tokyo] will get,” Cho said. He sees the current cycle of good and bad relations between Seoul and Tokyo continuing for the foreseeable future. South Korea and Japan met in Singapore Monday to discuss a Dec. 20 incident involving a radar lock between a South Korean warship and a Japanese P-1 maritime patrol aircraft. Seoul requested that Tokyo apologize for the aircraft flying low and possibly posing a threat against its vessel, which was on a humanitarian operation. Japan disputes South Korea’s version of events, and Japanese Prime Minister Shinzo Abe urged Seoul to put in place procedures to prevent similar incidents in the future. In this image made from video released, Dec. 28, 2018, by the Japan Maritime Self-Defense Force, a South Korean naval warship is seen as it allegedly locks its fire-control radar on a Japanese warplane, Dec. 21, 2018, in the disputed waters north of Japan. In addition, Japanese media reports that Tokyo’s defense ministry summoned the South Korean military attache to lodge a formal complaint and demanded a retraction of Seoul’s claim. South Korea’s defense ministry said Japan failed in those talks to provide definitive evidence backing its claim. “Japan did not disclose the radar frequency data that it has about our warship, which is a smoking gun, and instead only asked for information from South Korea. 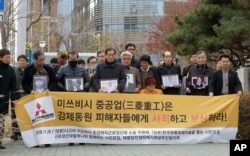 Such a demand is extremely rude and unacceptable,” said ministry spokeswoman Choi Hyun Soo. She further told reporters Tokyo’s request indicated a lack of desire on Japan’s part to resolve the matter. Both sides are expected to continue to hold discussions on the matter.